Mas Kagin Tapani: Madang Sustainable Development: A Ridges-to-Reefs Gap and Priority Analysis document. Madang Sustainable Development: A Ridges-to-Reefs Gap and Priority Analysis document. On behalf of MAKATA, let me take this opportunity to thank RAFT, the Australian Government, The Nature Conservancy, Madang Government, PNG Government, the Madang Civil Society Forum, USAID, and LEAF for your united efforts to produce the Madang Sustainable Development: A Ridges-to-Reefs Gap and Priority Analysis document. You have done well in capturing the work we have done in Kimadi, Magubem, Tokain, Yadigam, Mirap and Karkum contained in this report on page 29. 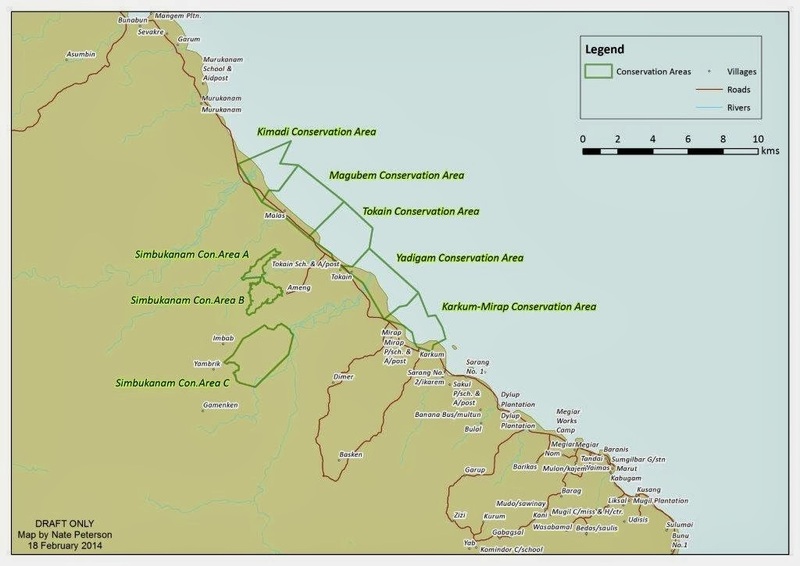 Our locally managed areas in Karkum-Mirap Conservation Area has 508 Hectares, Kimadi Conservation Area has 550 hectares, Magubem Conservation Area has 924 hectares, Tokain Conservation Area has 773 hectares, and Yadigam Conservation Area has 736 hectares. We have also done boundary surveys for Sarang in north coast, and Mur in Rai Coast and will do the same for Lalok, Male and Bom-Sagar in Astrolabe Bay in a couple of weeks time. Before returning to Port Moresby on Monday, March 3, 2014, I visited the Kimadi tribal people in Madang on Sunday March 2, and presented a copy of the Madang Sustainable Development: A Ridges-to-Reefs Gap and Priority Analysis document to their clan representative Peter Makan. The Kimadi and Magubem tribal people launched the marine protected area using their customary practice on 29 July 2013. This is one of the second coastal communities we worked with that have used their traditional customary practice of conservation to establish their marine protected area. The first community that did that were the Karkum tribal people in 2008. We have also helped them complete their Conservation Deeds both for Kimadi and Magubem and have presented it to them. They agreed to proceed to the signing of the CDs at their convenient time. Thanks to TNC's staff in Madang who gave me another extra copy of this document, making it possible for me to present that copy also to Karkum and Mirap villagers through one of my staff, Adolf Lilai. I would also like to extend my gratitude to Nate Peterson who helped developed our map from our original version. Nate has also promoted our work to other stakeholders. He is helping us develop Sarang boundary map. I am also grateful with Nate for sending us the PDF electronic copy of this document. Together we can make this world a better place for us all to live in.